Re-Start dogs are dogs that have had to have their coat or part of their coat clipped very short to humanely remove heavily knotted, neglected, matted or felted coats. A blade has to cut in between the skin and the matted coat. This page is to provide helpful after care information for when you take your pet home, how to prevent matts from happening in the future, why matted coats happen and why we don’t De-Matt dogs. 1. When you pick up your dog, please don’t laugh at or ridicule your dog. Dogs have been known to get what they call the “poodle sulks”. Before a re-start the dogs coat is heavy & tight to their skin, once the coat is clipped off they feel naked and exposed. The dogs behaviour at home can change, they may hide or not talk to you, so please try to keep everything as normal as possible for them to feel ok again. Aromatherapy or Adaptil sprays can help dogs with post grooming blues. Some extra spoiling with some yummy treats or bbq chicken can help them too. Taking them for a short walk or play a game with them can also help distract and or settle them. 2. Don’t let them rub themselves on furniture or carpet as this may cause irritation to their skin which is now more exposed with less hair to protect it. Their skin was restricted or pulled tight with matting and is now released which can cause a pins and needles or sunburn like sensation on their skin. This feeling can make the dog want to scratch themselves, which can lead them to self harm, bruise and rip their skin open very quickly. Close supervision is needed in the first 24 hours. 3. All dogs that have a re-start will get their rear nails filed. This reduces the incidence of them injuring themselves by scratching themselves open with freshly cut sharp nails. Please monitor this at home, distract them from scratching by taking them for a walk, play a game with them or give them a treat or suitable bone to chew on. 4. If redness or skin irritation does occur put a safe, dog friendly 1st Aid cream, lotion or powder on as soon as possible. Quit Itch, Aloe Vera, Savlon & Currash can be used or please check with your Veterinarian. 5. Do not apply topical long term flea /tick treatments for 3-7 days after the groom. This gives the skin a chance to cool, calm & replenish the natural oils on the coat so the product spreads evenly and works effectively. Remember to daily search for ticks if your pet has no other tick prevention. Read product labels or call their information line to discuss, or speak with your veterinarian. 6. 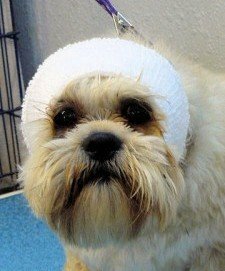 Removing matts from dogs ears comes with the risk of a hematoma forming. The dogs ears are initially heavy & weighted down with long thick matted clumps of hair. In some cases blood flow is restricted and or the ear has become gangrenous (esp cocker spaniels). When these are removed their ears suddenly feel light and airy. They then shake their head, which causes the soft ear leather to knock against the dogs head. Blood flow also increases to the ends of the ears and can make the ear feel thick, sometimes the skin on the ear starts to bleed. We use happy hoodies in the salon & let the ears dry naturally to help prevent hematomas from happening. We may send your dog home with a hoodie or you can make one at home yourself with a pair of stockings or sock. Sometimes we can remove light matting on the ears leaving enough top hair to cover to reduce how different it feels to the dog & it looks better sometimes too. Sometimes a dog will shake their head and knock their freshly clipped soft ear leathers and they will bruise or make the skin produce sebum and it will look like the dogs ear has been cut or a scab will form. 7. Please prevent your dog getting sunburnt until the coat grows longer especially for white or pale coated dogs. 8. Veterinary advice at the owners expense should be sought if complications arise from having a matted and/or neglected coat removed. Why does my dogs coat get matted ? 1. Not enough effective line brushing, combing or raking with the correct quality tools. 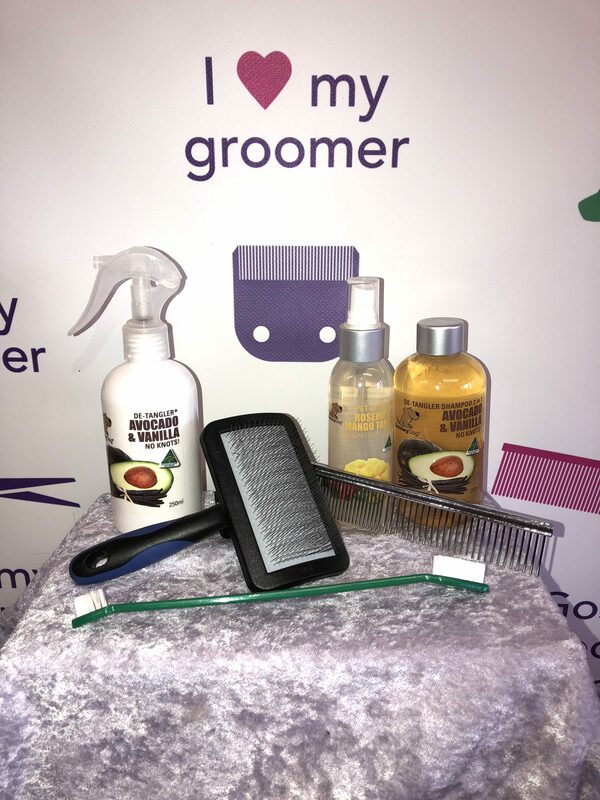 Professional Grooming kits filled with tools and shampoos approved and used by Gosford Grooming are available at our Narara salon from $77. We give free brushing lessons and are happy to advise what brands of tools work, salon grade tools work the best. Cheap pet shop brushes scratch the dogs skin and the dogs don’t like them. Cheap pet shop combs don’t get through the coat like our salon grade combs do. You need to see through to the skin when you are brushing and combing, your comb should be able to glide through the coat all the way down to the skin. Just brushing the top coat wont prevent matting. 2. Too long between visits to professional groomers. The longer length of a haircut the more often the dog needs to visit their groomer. We have a coat length chart in the salons to help guide you. Anything longer than a 3 blade needs to visit 4 weekly. 3. The dogs lifestyle and the coat length don’t match. For example if your dog swims in the pool, beach or dams the shorter their coat needs to be or the more coat brushing AND combing is required. Every time a knot in a coat gets wet and dry it gets tighter & bigger. Tree sap, farmers friends, burrs and grass seeds also matt up a dogs coat very quickly. 4. Coat Change period. From about 7 months of age when your dog reaches sexual maturity their coat will change from the soft fine puppy coat into a thicker, coarse & stronger adult coat. During this change the dogs coat will matt up very quickly and will sometimes need grooming every day. Poodles in show coat will need brushing morning & night (remember to pre spray a dry coat with a Gosford Grooming recommended conditioning or detangling spray). Short haired dogs shed their puppy coat completely. On long haired dogs you can see the puppy hair at the end of the hair with the adult coat growing from the skin. 5. Matting can be caused by only using a shampoo to clean the coat. Longer coats are more manageable if they are conditioned, or use a 2 in 1 shampoo. 6. Not frequent enough bathing can cause matting. Oil, dirt and dead skin & hair builds up in the coat causing it to join together to form clumps or matts. 7. Matting can be caused by shampoo residue left in the dogs coat. So please rinse, rinse and rinse again when bathing your dog at home. 8. If your dogs has allergies or fleas the dog will scratch & chew its coat forming matts as saliva acts like glue in a dogs coat. 9. If you have dogs that play by mouthing each other, usually around each others necks, the saliva can help form matts in the dogs coat or by the dog breaking & damaging the hair. New puppies in the house have been known to hang off older pets ears and tails causing matts. 10. Matting can occur or re-occur if you have previously had your dogs coat de-matted or de-tangled. This is because in the de-matting procedure hairs get damaged and broken at different lengths and therefore can re-matt up again very quickly. 11. Matted coats occur because dogs wear harnesses which cause rubbing and friction on the coat. 12. If you put a fabric jacket or jumper on your dog for winter to keep them warm you will also need to brush them daily as the jacket will rub the hairs together causing matts. Having a shorter natural coat underneath a fabric jacket reduces the grooming needs. 13. Matts will start where there is movement. Matts start behind the ears, in the armpits, a wagging tail and then the matting spreads connects all together. 14. Your dog has a combination coat. Oodles, poodle crossbreeds, labradoodles, groodles have a variety of coat textures. A combination coat has a hair that sheds like a Labrador or Cavalier King Charles Spaniel coat as well as having a continuously growing long hair like a poodle. 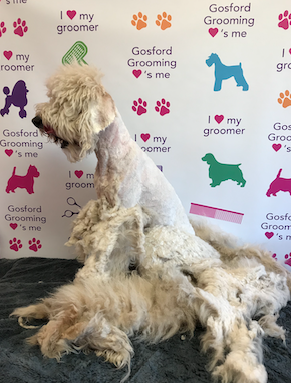 Unfortunately some oodle dogs have very very bad combination coats that matt up very quickly and are even hard for professional groomers to maintain. These dogs either live very matted lives or are clipped down with a 7 blade every 4 weeks. Any longer than 4 weeks growth becomes unmanageable. Schnoodle or Schanuzer x poodle combination coats are quite difficult to look after as they can have 3 different hair types within the coat. A oodle coat will always matt up quicker than a show standard purebred poodles coat. 15. Matting can occur if you shampoo and or condition your dog, let them naturally dry but then don’t brush or comb them whilst drying or once they have dried that day. We are experts in de-knotting & de-shedding painlessly, with ease using the right techniques, equipment, shampoos & conditioning sprays. However we will not de-matt. If a matt can be pulled apart with your fingers then they can usually be saved humanely with the right tools & products. We will not de-matt an entire dogs coat ever, we are experts in saving dogs lightly matted or knotted ears & tails for $1 per minute. 1. De-matting can be painful during the groom and for several days after. This is because some good live hair is unavoidably pulled from the skin during the de-matting brushing & combing process. Good live hair is tangled, knotted or matted in with dead, damaged or non-conditioned hair. 2. De-matting damages the trust or bond between the groomer and the dog. Dogs develop a negative association with grooming and their groomer when they are de-matted even only once or if they are de-matted fully or part thereof every visit. No matter how gentle & patient you are in brushing, splicing, combing it’s just much better to prevent your dogs coat from getting matted in the first place. 3. De-Matting comes with higher injury risks of brush burn, earflap tears, cuts or nicks from splicing the coat with scissors or sharp de-matting tools. 4. It is time consuming and therefore expensive, taking too long to complete a groom is not fair or kind to the dog. 5. De-matting with brushes & combs creates “knot-Shy” dogs for future grooms. The dog may undergo a de-matting session but goes home feeling uncomfortable and makes a negative association with grooming. This can turn a nice compliant well behaved dogs into a dog that resists, screams or bites when you accidently snag a knot in their coat. 6. It’s not kind or smart to catch up on a week or a months worth of brushing in a few hours. If the coat has gone from matted to felted it is impossible to reverse and needs to be clipped very close to the skin to get the felt off. 7. Even when some ear or tail hair is humanely saved, a lot of hair can still be lost in the process leaving a fine amount of hair that doesn’t look nice. In this case it would be better to just re-start by clipping it off to the skin. 8. The dogs skin is it’s largest organ so we need to look after it, de-matting can cause skin irritations, inflammation, folliculitis & post grooming ferunculosis. 9. No-one is the winner when a dog is dematted. Be your dogs friend and prevent matting or ask for a restart clip. Matted Coat being humanely clipped making for a happy Re-Start dog. Grooming kits are available at our Narara Salon from $77. Highly recommended for new puppy owners.